As we near the ten-year anniversary of the iPhone later this week, a few stories posted online have delved into the rich history of where the device started, how the original team came up with the idea for the touchscreen smartphone, and what it was like reviewing the device back in 2007. In a new video shared by The Wall Street Journal today, three former Apple executives -- Scott Forstall, Tony Fadell and Greg Christie -- have taken a look back at the first days of designing the iPhone with Steve Jobs. 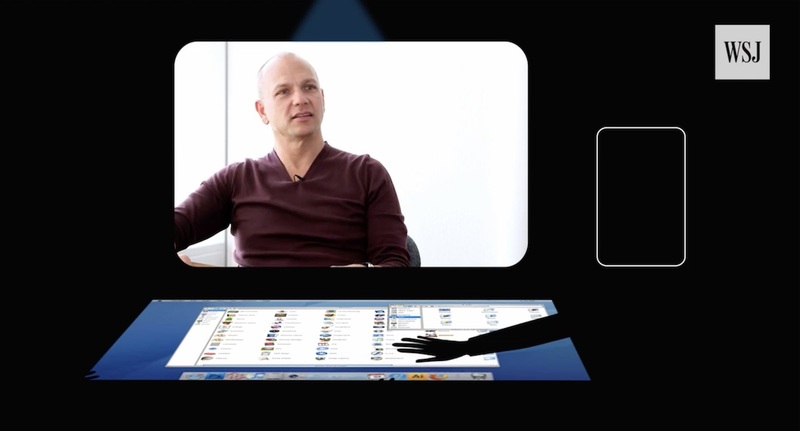 Apple's former senior vice president of the iPod division, Tony Fadell, recounted a time when Jobs showed him the company's first demo for what would become the iPhone's touch-based operating system. Jobs and the rest of the team were seeking a more elegant solution to a smartphone interface than the one they began with, which was an iPod click wheel interface, when Jobs invited Fadell into a demo room. "Steve goes, "Come over here I need to show you something." So he walked me into the room...and it was basically like a ping pong table sized demo with a projector that was projecting a Mac interface on it. And you could use your whole hand and you could touch different things on it, like it was a big big Mac. It was literally a ping pong sized multi-touch display. And he goes, "I think this is gonna solve our problem." Former Apple vice president of iOS, Scott Forstall, recalled a specific time in 2005 when the iPhone team was put on a deadline of two weeks to come up with a better design for the smartphone's user interface. Jobs was not satisfied at the time with early iterations of the iPhone's look, and told Forstall and the team that he'd give the project to another group at the company if they failed to deliver. Greg Christie, former Apple vice president of human interface, said that the team's design ultimately satisfied Jobs, and led to even more work over the next two years before the iPhone's launch in 2007. "The first time he saw it he was completely silent, he didn't say a thing. He didn't say anything, he didn't gesture, he didn't ask a question. Then he sat back and he said, "Show it to me again." And so we go through the whole thing again and Steve was pretty much blown away by the whole demonstration. It was great work. Our reward for doing a great job on that demonstration was to, you know, kill ourselves over the next two and a half years." In 2006, Forstall froze development across the iPhone's user interface divisions to force the team to focus on one troublesome part of the smartphone's UI: the keyboard. At the time, Forstall said it was difficult to use and that if someone tried to type out an e-mail, they'd just "give up." Forstall explained that one of the best keyboards pitched by a developer had a few clever advantages over all the others designed by the team. Namely, it could intelligently predict words, so if a user would type "T," the keyboard would make the hit region for "H" larger -- while the actual key remained the same size -- so that common words such as "the" were easier to type. The full ten-minute video created by The Wall Street Journal, which is called "How The iPhone Was Born: Inside Stories of Missteps and Triumphs," is well worth checking out. Other topics discussed by Forstall, Fadell, and Christie include the creation of the iPhone's visual vocabulary (like pinch to zoom and rubber banding to mark the end of a scrollable page), as well as the company's Fight Club secrecy tactics for "The Purple Project," the code name for the original iPhone's creation. The firing of Scott Forstall really reveals the cluelessness of Tim Cook. Unlike Cook, Forstall had vision. Cook is a typical suit. He's an MBA who does an excellent job at pleasing shareholders, but a major letdown for customers who care about cutting edge innovation. THANK YOU to the engineers who have made my life easier and more productive over the last few years. Criticisms aside (and there are many valid criticisms aired daily on this site), I remain in awe of the Apple tech that I use daily (most recently the Watch). Keep up the great work. Instead of talking about who is the better CEO, shouldn't we be commenting on how lucky we are that only 10 years out, we are able to bear witness to the minds that actually developed this incredible device? I relish every new interview that comes out, because to me, a tech enthusiast at best, is just constantly amazed at how a core group of engineers and designers and other people were able to come together and create a product that never existed before. The stories they are slowly telling the public is constantly fascinating and enlightening. The fact that we didn't have social media when the Mac 1st came out illustrates how little there is to know about the development of the Mac (publicly available media that is), and now because of social media, we can more easily find out how the iPhone was created. What a time to be alive truly. Steve Jobs best achievement when returning to Apple was not the products, but rather, the leadership team. That includes Tim Cook. Scott Forestall clearly blew it by being unapologetic and too proud during the maps kerfufle. Though Tim Cook may not be as involved in design as Steve Jobs was, Tim is a genius at globalizing Apple and its products. That and to ensure that his vision carried through his leadership team is why Jobs entrusted Tim Cook With the position of CEO. It is the responsibility of a CEO to keep people under control. Since Tim Cook was unable to keep Scott Forstall under control yet Steve Jobs was able to, it's proof that Cook is unfit to be CEO. And yet Steve Jobs disagreed with you. Not if he couldn't keep Forstall under control. Steve Jobs could. Once he was gone Forstall apparently annoyed the rest of the core team to no end. Maybe he'd be OK if he came back now. But he didn't take responsibility for the Maps fiasco. And for some reason, Apple seems to get all the credit? They do because they put that tech into a usable product. Moreover, the leadership and many, many engineers refined the interface to feel more intuitive. He wasn't gunning for the CEO position. And was not qualified for that either. He was let go for not being a team player. If I’m remembering the details correctly, he chased off the INCREDIBLY talented, Bob Mansfield... into early retirement. Apple needed Bob FAR more than “fit throwing” Forstall. Clearly. Tim went to him personally & agreed to oust Scott AND give him a salary of $2 million/month, if he’d come back, even temporarily. Then they got him out of retirement AGAIN, to do the vehicle feasibility study. We don’t hear as much about him, but my impression is that Bob was a key employee and an absolute hardware god at Apple... got s**t done & didn’t need to anger people to accomplish his goals. I wonder what we would be using today if Steve Jobs was still alive. He was a true legend. Remember, it was Steve Jobs who hired Tim Cook back in the late 90s and it was Steve Jobs who recommended Tim Cook as CEO to the Board of Directors so Cook must have done something right.